Mayor Daley's creative bout of amnesia in his recent Park Grill deposition took me on a trip down memory lane to one of my favorite moments of the early millennium. That would be then congressman Rahm Emanuel's 2005 oration on corruption—a masterful performance of bootlicking, artfully dressed up as criticism. So that Emanuel effectively condoned the very political behavior he said he wanted to end. Thus leaving Mayor Daley free to continue it. In short, Emanuel earned points for criticizing the boss, while continuing to kiss the boss's behind. And you wonder why Rahm beat everyone in the race to the top. Let me take you back in time in my time-travel machine . . . 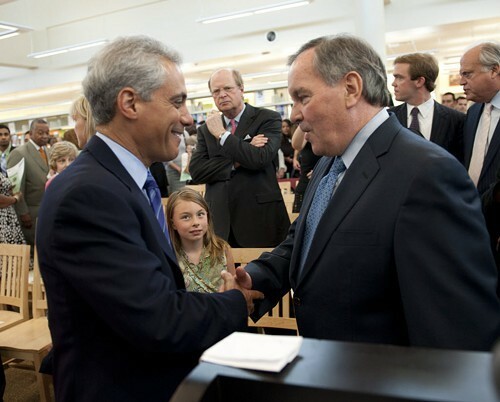 It was the summer of 2005, roughly midway though Mayor Daley's second-to-last term in office. He was engulfed in at least four major scandals, including the Park Grill. That's the scandal in which his administration awarded a concession to run a restaurant in Millennium Park to a company run by a man whose lover was a high-ranking Park District official. Just in case you, like Mayor Daley, had forgotten. Back to Congressman Rahm's speech. His challenge was to acknowledge that mistakes had been made, while absolving Mayor Daley of the blame of making them. Hmm, how to pull this off? First, he leaked to the Sun-Times that he was making the speech, claiming that the idea came to him in a flash one day while he was taking an early-morning swim. As opposed to something he'd been cooking up in endless strategy sessions with various advisers and aides. On August 25, he gave the speech at the City Club. His basic theme was that Mayor Daley was so overwhelmed with doing the really important things for which we remain eternally grateful that he didn't have time to worry about the little stuff. "My gut tells me he doesn't really care about the nitty-gritty of politics," Emanuel said in his speech. "It's just not what his interest is. But guess what? In government, there's politics. So you don't get a pass to say, 'I give it to somebody else.' He outsourced, which is one of the reasons I'm against outsourcing." To his credit, Emanuel delivered that line about Daley—the son of the man who built the machine—not caring about the nitty-gritty of politics with a straight face. After the speech, Emanuel met with reporters to assure everyone that his relatively mild criticism of Mayor Daley did not in any way diminish the monumental amount of love he felt for the man. And that, of course, he would endorse Daley for reelection. "It's more than an endorsement," Emanuel declared. "I want him to run. If he chooses to do it, and I hope he does, I am going to work for his reelection." When Emanuel was done, he'd sent an unspoken message to Chicago's larger political community that the big money—which Emanuel was so good at raising—was staying with Daley. So don't even think about running against him. Two years later, Mayor Daley won an easy reelection. Soon thereafter he outsourced the parking meters in a deal that makes the Park Grill look like small potatoes. Then Mayor Daley outsourced his own job to Emanuel. Who, despite his avowed opposition to outsourcing, had the City Council reapprove the parking meter deal. Who's telling the truth in the Rahm-Daley feud? We need a Truth and Reconciliation Commission to get to the bottom of this after Bill Daley slammed Mayor Rahm recently.